HAPPY MOTHER'S DAY EVERYONE. Wow had such a busy weekend. Celebrated my birthday and today relaxing with my fur babies . I just finished a very beautifully written book today. This is the book that every horse lover should read. 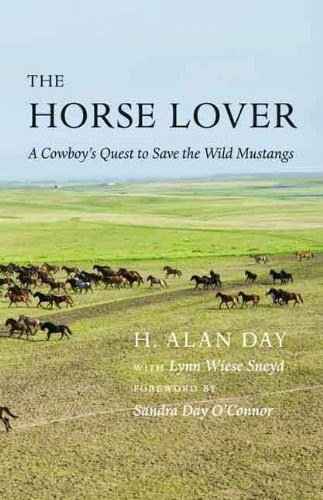 It is the memoir of Alan Day and his attempt to save the unadoptable wild mustangs. A horse lover and rancher , Alan decides to turn a ranch in South Dakota into a sanctuary for these wonderful beautiful animals. So thus the Mustang Meadows Ranch was born . The first ever government run sanctuary. I couldn't put this book down. I was so wrapped up in the story of the mustangs . The story might of been a memoire of Alan but I also believe that this book is a memoire of the wild mustangs that were so much of his life for those five years. To hear the thundering of all those hooves would be soul changing. To entwine their story with Alan's story was nothing but beautiful. You feel the love that Alan has for all the horses that have come into his life. The horses have played such an pivotal role in shaping the way Alan trained them. He was horse whispering before Horse whispering was all the rage. The memories of his interactions of his horses through out his life fit right in. I want a Saber and an Aunt Jamima in my life . Those horses were all heart and soul. But I will say there were some very sad parts in this book that had me , as a horse lover. crying buckets of tears. I know how Alan felt when he had to do something that was entirely against everything he was trying to do on the ranch. I almost couldn't read that part it broke my heart. But I did and understood every feeling he had . When he had to do it. This memoire has reclaimed my passion for all horses . How I want to capture the horses on film to keep their proud and beautiful spirits free. Before they are no more around. I want to thank Mr Alan Day for writing this book . You wove magic with your words . You took me on an adventure . I was cheering and crying right along with your words. As a horse lover and breeder , I just want to say again thank you .